Engineering needs women for a simpler, larger reason: Because solving problems needs creativity. Engineers are good at solving problems. We make bridges safer, computers faster and engines more efficient. Today, the profession is working on an especially thorny problem: gender equity in higher education. While other fields of study continue to make significant advances towards gender equity, engineering schools are still struggling to pull their numbers of women students past the 20 per cent threshold. This week, McMaster University is hosting a conference for more than 150 deans of engineering from schools around the world. One of the major issues we’re discussing at this Global Engineering Deans Council Conference is the gender imbalance that remains a challenge across the field. We are making progress, but we need a breakthrough. Our increasingly automated, mechanized world requires more engineers than ever, and demand for them is expected to grow. And the largest pool of under-utilized talent is right here: the women who would make great engineers, but choose other careers. Why don’t they choose engineering? Some turn away as early as Grade 6. Research shows that this is the point when many girls simply turn off math and science, even though they have performed as well as their male classmates until that point. We must reach kids before this juncture to show them how useful engineering is to everyday life. We need to show them how easy and interesting it is to write computer code and build apps, to help them use technology to build things and solve problems. Some say women are just not interested in engineering. Once, they said women were not capable of succeeding in engineering. Clearly that was untrue, and so now we are trying to correct the idea that they are not interested in engineering simply because they are women. Could it be the way engineering has portrayed itself? 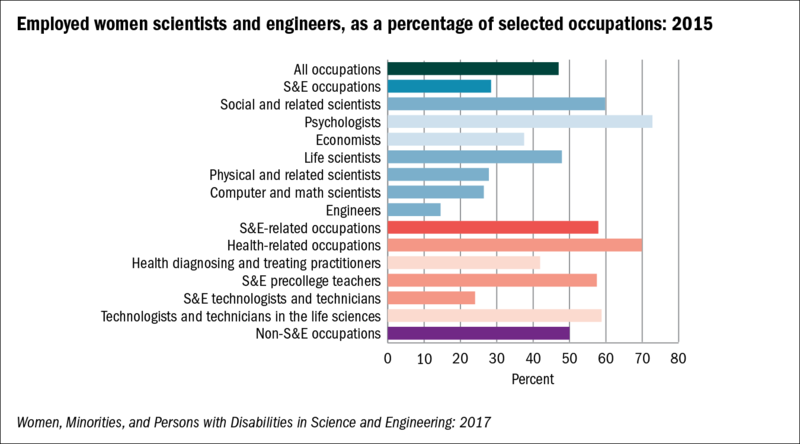 For too long, engineering has presented itself as a field that recruits top brains from the abstract realms of mathematics and science and shapes them into problem-solvers. Engineering might seem more attractive to everyone, women and men, if instead it presented itself as a profession of creative, helpful problem-solvers who use math and science as some of their tools. Engineers don’t solve only cut-and-dried problems. They also solve ambiguous problems, where there is no single solution. Five groups of engineers who tackle the same problem can come up with five different applicable solutions. Hence, it is crucial that we project the ambiguity of engineering problems and that their solutions demand creativity. Doing so will transmit a more compelling message to women and men alike. We must also critically examine the culture of engineering. I have learned through numerous conversations with women that the male-centric culture of engineering often puts them off. On average, they also earn less than their male colleagues do. Despite sincere efforts, a stubborn nub of resistance remains in the broader engineering culture that is antithetical to women’s point of view. It is certainly not universal, but in the corners where it prevails, it is tiresome and antiquated. This old culture is even apparent in the structure of the engineering building where I work. It was designed in the 1950s and bathroom spaces for men outnumber those for women four to one. Does that send a message that old ways are changing? Women who might think about engineering look at faculty leaders and still see mainly grey-haired men. We are working on that. At McMaster, as a result of deliberate recruitment, 40 per cent of our assistant professors of engineering are now women. As they advance, our senior ranks will move closer to a true balance. At McMaster we are also working to remove the barrier that biology unfairly places in the career paths of women faculty members, by making sure they are not indirectly penalized for taking parental and other life-event leaves. We are ensuring there are resources available so their research continues in their absence, so they do not fall behind because they are having children, and so they can step directly back into their teaching and research careers after their parental leaves. This is not only about fairness, though. Engineering needs women for another simpler, larger reason: Because solving problems needs creativity. And creativity demands a diversity of viewpoints. Without input from women, engineers would have access to only half the total pool of creativity, constraining their ability to solve problems and limiting the applicability of the solutions they do reach. Only when the body of engineers truly reflects the society it serves — in terms of age, ethnicity, religion, physical ability, sexuality and gender — can it most effectively serve the needs of that society. Only then will it understand all the communities it is serving, harness the widest variety of viewpoints and generate prosperity for all.